← The Shofar Has Roared, Who Shall Not Fear? When Daughter asked me to read the monitor that had been attached to her belly for twenty-four hours, I confused the numbers. Feelings of incompetence increased when I returned from the food court with an omelette sandwich for Son-in-law that was swimming in his coffee. Said coffee dripped all over the Ichilov birthing room in which Daughter and Son-in-law had spent Yom Kippur. I had been there only two hours and couldn’t do anything right. I rushed the rice and beans and sinking omelette onto a bench in the corridor. I gathered slippers, overnight cases, almonds, a jug of cider and baby-wipes—the young couple’s camping gear—into a pile and shoved it behind the door. “Turn on the light,” Midwife commanded. I couldn’t find the switch. Meanwhile Midwife and Learning Assistant opened a clean tray of weapons and gloves. “Is this the birth?” Daughter, Son-in-law and I asked. Damp black hair inched into the outer world. Son-in-law took photos until Daughter told him to stop. I rubbed Daughter’s shoulder. Midwife said, “Push.” Daughter did “a wonderful job,” amidst cries of fury and shouts of pain. After the wet hair came the whole head. A tiny red body covered in white goop, smaller than a Number 2 chicken, followed. A grayish cord took up the rear. Baby was born nineteen hours after the Gates of Heaven had closed, proving once again that when one gate closes, another opens. I pat Daughter’s head. We cried. There we were, five generations of Grossman girls: Baby, Daughter, Me, Mom and Grandma. Four hours later, when all the girls were in their places, I left the hospital. I was too hungry excited and exhausted to walk back to the mundane bus station and stand in some ordinary line. Rather, I walked to the Eden Humus Bar in the basement of Gan Ha’ir. Daughter and I had frequented this place often during her first year in Tel Aviv when fertility was a question. As we shared wholesome salads and humus, we watched toddlers play on the nearby Gymboree and wondered if and when Daughter would take a child to such a place. Now as I ate I thought about buying Daughter a nice robe. Mom always brought me nice robes when she visited from the States for the births of my three babies. After the humus, I walked into Afrodita. The robes there seemed foolish. At Intima a lovely vanilla viscose gown called to me. Too elegant for a new mother, I told it. The robes Mom chose were beautiful and practical. They lasted forever, accumulated spit-up and spaghetti spots making them more homey. Leaving Gan Ha’ir, I walked down Ibn Gvirol, craving apple strudel. While searching for a lingerie shop and a Hungarian bakery, I passed a used-clothing store. I went in and said, “My daughter gave birth today and I want to buy her a robe,” expecting the two other women in the store to drop their purses jump and clap. “Something simple, not too ungapatchka. Preferably cotton.” From a bottom shelf the saleswoman pulled out a folded cotton robe of a pale faded pink. A wisp of delicate white lace bordered the collar and each cuff. Pastel blue and pink applique flowers with pastel green leaves decorated the wide collar that opened to the waist. Small white beads embellished the collar. I imagined Baby pulling the beads with her intricate perfect fingers and putting the little ersatz jewels into her searching circling mouth. The robe reminded me of Bonwit Tellers, an elegant store where Mom took me shopping for party dresses in the 1950’s. If Daughter didn’t like the robe, if it was too impractical, I told the saleswoman as she stuffed it into a used plastic bag, I would keep it. I walked on, weighted by the robe and Baby’s first sound. It came after a tense silence, more like a baby bird’s squeak of admission than a human cry of rage. A coffee shop on Arlozorov, two blocks from the bus station, sold apple cakes. The cashier agreed to sell me half a cake. I could eat a quarter there and take the rest home. “Is it Hungarian?” I asked. “Isn’t all apple cake, I mean strudel, Hungarian?” he said. That night in my dreams I was visited by my gray-haired female friends and relatives who are in their seventies, eighties and nineties. They were all smiling animated and delighted to see me. I awoke and thought about my momentous day. Everything that had seemed random and spontaneous after I left the hospital became deep and meaningful at night. The robe was my homage to Mom, for she loved lace, beads and beautiful clothes. I knew she would have sent such a robe if she could, either for Daughter or Me. The cake was my homage to Grandma, a feisty four foot eleven inch woman from Budapest who, every year before the Gates of Heaven closed, baked apple strudel. Now awake in bed at 3:30 AM, I recognized my new status. Daughter Son-in-law and Baby were not the only ones in that birthing room who had slid through new passages. A gate had opened for me too and I acquired a new title. This was a title on which I had been working unconsciously for thirty-seven years. Only now was the gate of consciousness opening. My excitement propelled me from bed. I walked to the living room. In the dark I found the used plastic bag, lifted the folded used robe and draped it over my frailing body. It broadened my shoulders with its enormous collar. It was miraculously appropriate for my new title. I stood tall, despite my inheritance from Grandma, and marched through the luminous darkness of the living room as if on a ritual walk crossing a deep crevice in the earth. As I marched, two rows of women stood on the other side, waiting and smiling. They welcomed me to their ranks with winks. I was one of them now. A Matriarch. This entry was posted in Identity, Uncategorized, Walking and tagged apple strudel, daughter gave birth, new title. Bookmark the permalink. Welcome, Judy, welcome to Matriarch Land. May you and your family enjoy the gifts of the generations. Mazal tov, Savta! Enjoy the naches! Nice but weren’t you a grandmother before this? 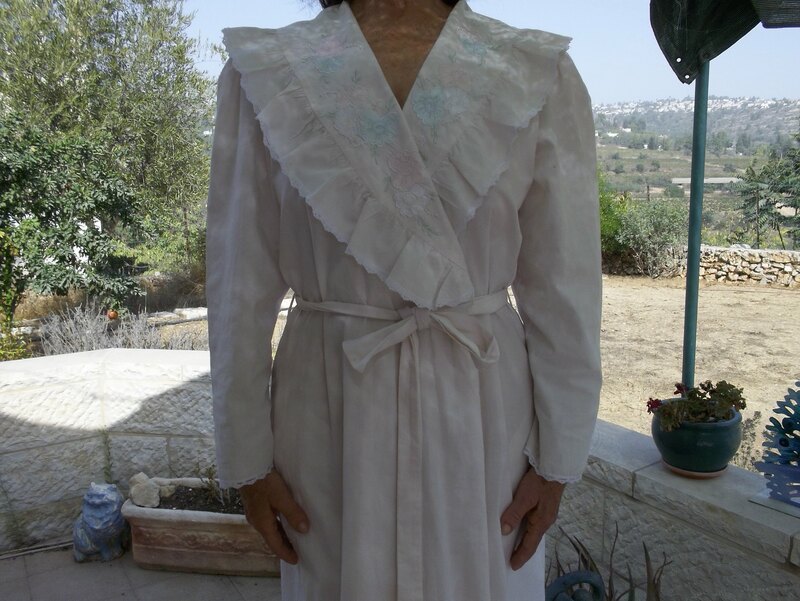 Mazal Tov .I ‘m glad you included a photo of the robe. I was curious to see what it looks like. Yes, I was a grandmother, but I didn’t feel like a Matriarch. What’s the difference? Having grandchildren from at least two children. This brought tears to my eyes. Thanks for the honesty and the reminder about our important heritage of women. I loved this post. Best use of the Gates of Heaven phrase I’ve heard all year. And, as always, your subtle wit is unmatchable. The bonus? The photo of the robe, a perfect fit. Thank you for this. The photo is a perfect ending to this chapter of the story. I loved the baker’s comment about all strudel being Hungarian, and even that you needed to have Hungarian apple cake. Your transition into Matriarch imbues the (experience of) fumbling in the opening paragraphs with meaning. Wonderfully done! I was wondering if that fumbling worked, so thank you, Andrew, for your comment. Why shouldn’t a Matriarch be inept at the most extraordinary moment of her life? Last night started wondering about Sara’s Mom and Grandma. Any midrashim about them?